So how hard does your York Councillor work for you? The York Council has published a prompt response to our annual request for information about Councillor issue raising numbers. 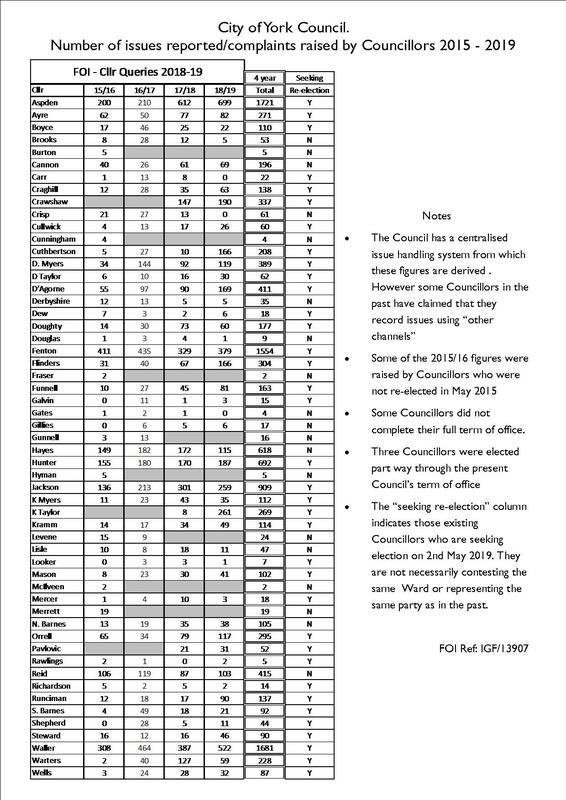 This allows residents to see how many issues have been raised during the last 4 years by individual Councillors. The information is published at the end of each year. All Councillors have access to the central complaints handing service at the Council. Some have claimed in the past that they choose not to use it. One or two say that they use the “report it“ on line system, although this is limited to certain types of issue. As well as monitoring public service standards and pursing local problems, Councillors have other roles. These include attendance at a range of meetings. Either way, York enjoys the services of some hardworking local representatives who will legitimately hope for re-election on 2nd May.